7 : Whereas, the Commission has directed that ‘Authenticated Photo Voters Slip’ shall be distributed to the electors. (xi) Authenticated Photo Voter Slip issued by the election machinery. 10 : In the case of EPIC, clerical errors, spelling mistakes, etc. should be ignored provided the identity of the elector can be established by the EPIC. 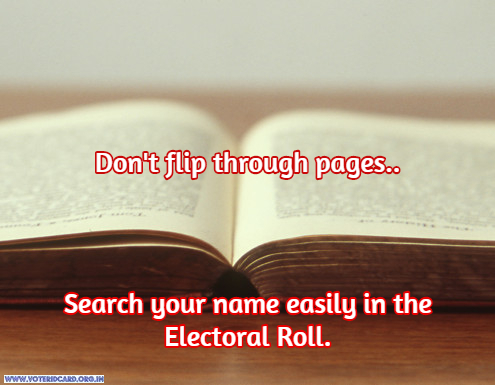 If an elector produces an Electors Photo Identity Card, which has been issued by the Electoral Registration Officer of another Assembly Constituency, such EPICs shall also be accepted for identification provided the name of that elector finds place in the electoral roll pertaining to the polling station where the elector has turned up for voting. If it is not possible to establish the identity of the elector on account of mismatch of photograph, etc. the elector shall have to produce one of the alternative photo documents mentioned in para 8 above. 11 : Notwithstanding anything in Para 8 above, overseas electors who are registered in the electoral rolls under Section 20A of the Representation of the People Act, 1950, based on the particulars in their Passport, shall be identified on the basis of their original passport only (and no other identity document) in the polling station. Voting in India is a Constitutional right if one is a citizen over 18 years of age. However, that also makes it optional. It has been a tendency among voters, especially in the urban areas, to treat the voting day as a day of rest. While skipping the vote may not seem to cause any harm, the long-term consequences are disastrous. Agent of change: Voting is the agent of change. If the people of India think that the ruling government is not performing its duties satisfactorily, they can show it the door by voting against it. Refraining from doing so can result in the same party, or a worse one, being elected for the next five years. Every vote counts: In a country so populous, a voter might feel that a single vote does not make any difference. However, the balance tilts when this becomes a national attitude and lakhs—perhaps Crore—of votes are not cast. By casting their vote, citizens may not necessarily be able to get the best candidate elected—politics being what it is—but by avoiding casting their vote they improve the chances of the unsuitable ones winning the polls. At the end, it is only the voter who has to suffer through poor governance. Get heard: Voting offers every citizen a medium of expression. In a country as vast and diverse as ours, different regions have different concerns and priorities. The process of voting allows every citizen to have a say in what should constitute the matters of importance by voting for the candidate he or she deems fit for the purpose. While it is true that the outcome of elections is seldom predictable, by not casting one’s vote, that citizen is giving up on the chance of getting heard. Voting as a responsibility: Voting is as much a responsibility as it is a right. The whole edifice of Indian democracy is built on the foundation of voting. If citizens are not careful about casting their vote—or worse, skip their vote altogether—it will jeopardize the existence of our democratic Republic. Voting as an honor: Finally, voting is an honor conferred on the citizens by the founding fathers. By exercising their right to vote, citizens demonstrate their respect for the history of the country. It can’t be denied that the recent democratic experience in India has not been encouraging. For the past several years, India has been struggling with rampant corruption, unsure economy, and unclear foreign policy. Election after election has seen ineffective governments come to power that have done more harm than good. However, not casting one’s vote will only worsen the condition. It is our duty as responsible citizens of India to make informed decisions and choose the best candidate from those presented. Moreover, with reforms like Right to reject gaining wider support, it wouldn’t be long before the system of elections is improved.